ALDRIC (ALDERICUS, AUDRY), after spending his childhood in the court of Charlemagne, St. Aldric left at the age of twenty-one to commenced studies for the priesthood. Following ordination, he was chaplain in the court of Louis the Pious for nine years. St. Aldric was consecrated fourteenth Bishop of Le Mans in 832 and was known as an excellent administrator and pastor of great personal sanctity. Following the death of Louis, St. Aldric supported Charles the Bald as successor, resulting in St. Aldric exile from Le Mans. Though he was soon reinstated by Pope Gregory IV. St. Aldric also served as Papal legate to King Pepin of Aquitaine and participated in the Council of Paris and Council of Tours. 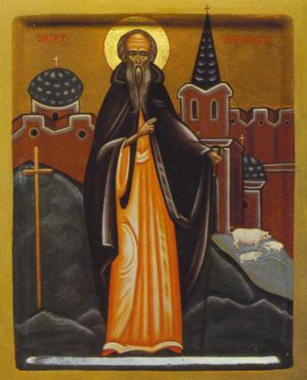 St. Aldric reposed in 856. ANASTASIUS, fifty-fifth Archbishop of Sens in Burgundy from 967 until his repose in 976. St. Anastasius was a great champion of the Abbey of Saint-Pierre-le-Vif, in whose church his relics are enshrined. BRANNOC, A sixth century saint, legends concerning him vary and are unreliable. However, it seems that he served for a time as tutor to the children of King St. Brychan of Brycheiniog (6th April), and accompanied the king on a pilgrimage to venerate the tombs of the Apostles, possibly stopping in Brittany on his return for several years. Returning to Britain, he founded a monastery at Braughton, near Barnstaple in Devon, where his relics are said to rest beneath the church altar. CRISPIN (I & II), there are two St. Crispins associated with the See of Pavia in Lombardy. The first, was a third century Bishop of Pavia for 35 years, he reposed circa 250, and there is no further information on him extant. The second was Bishop of Pavia during the fifth century His episcopacy coincided with Pope St. Leo the Great’s (10th November) papacy, and St. Crispin (II) was a signatory of the acts of the Council of Milan (451) at which the bishops of northern Italy endorsed the acclaimed Epistola Dogmatica of Pope St. Leo the Great (10th November) against Nestorianism and Eutychianism. St. Crispin (II) reposed 465. CRONAN BEG, (Seventh Century), a Bishop of Ændrum, Co. Down, Ireland, St. Cronan Beg is mentioned in connexion with the Paschal Controversy in 640. There is no further information extant. ÉMILION (ÉMILIAN, EMILIANUS) of COMBES, a monk at Saujon near Saintes, where his wonderworking drew large numbers of pilgrims. Seeking solitude, St. Emilion fled to the forest of Combes near the present-day village of Saint-Émilion where he spent the rest of his days as a hermit. St. Emilion reposed in 767. St. Emilion is the namesake of the Bordeaux wine appellation d'origine contrôlée Saint-Émilion, and the Cour Saint-Émilion station of the Paris Metro. KENTIGERNA, St. Kentigerna was the mother of St. Coellan (29th July) and the daughter of Kelly, Prince of Leinster, Ireland. Upon the death of her husband, she left Ireland and moved to Inchebroida Island in Loch Lomond, Scotland, where, along with her brother St. Comgan (13th October) and her son St. Foellan (9th January), she lived as an anchoress until her repose 733. A church remains dedicated to her to this day. REINOLD (RAINALD, REYNOLD), a possible descendant of Charlemagne, St. Reinhold received monastic tonsure at the Abbey of St. Pantaleon in Cologne and was given the obedience of supervising construction at the abbey. In 960 he was beaten to death by stonemasons working at the abbey and his body was thrown into a pool of water neat the Rhine River. It is said his body was later discovered through divine revelation. TILLO (THILLO, THIELMAN, THÉAU, TILLOINE, TILLON, TILMAN), a native of Saxony who was kidnaped, enslaved, and then brought to the Low Countries. St. Eligius of Noyon (1st December) ransomed St. Tillo who then enter the Abbey of Saint-Pierre-Saint-Paul de Solignac where he received monastic tonsure and was ordained to the priesthood. St. Tillo then worked to enlighten the areas around Kortrijk and Tournai in present-day Belgium. Towards the end of his life, St. Tillo retired to live as a hermit at Solignac. He reposed 702. VALENTINE, an abbot who became a missionary bishop in Rhaetia (roughly the area of the borders of present-day Italy, Austria, and Switzerland). Later in life St. Valentine retired to spend the rest of his days as a hermit at Mais in the Austrian Tyrol where he reposed circa 470. WITTIKUND, a pagan Westphalian duke who converted to Christianity following a vision. With Charlemagne as his sponsor, St. Wittikund received the sacrament of Baptism in 785. He reposed circa 804 at Enger in present-day Germany.